Volkswagen’s planning a huge “we’re sorry about the diesel thing” onslaught of electric cars, and next up in that is this: the I.D. Vizzion Concept debuting at the Geneva Motor Show. I’m happy to report that the car, aimed to be produced by 2022 “at the latest,” will, initially at least, have a steering wheel after all. It’s also got a giant battery that bests Tesla’s whole lineup. 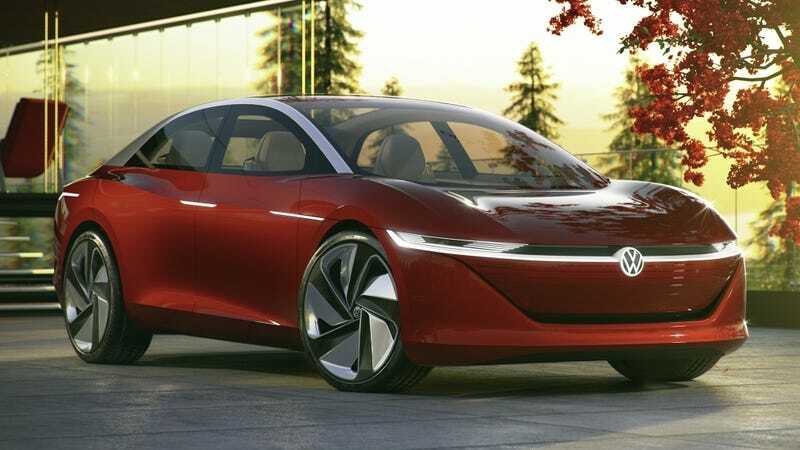 A steering wheel-less and pedal-less version of the Vizzion is still in its future, however, though Volkswagen says that will only happen once they can produce a version that has Level 5 autonomy, a level not requiring human participation at all. Until then, though, the car, powered by a 111 kWh battery, will have a steering wheel and pedals, for when humans need to intervene. It will make around 300 horsepower, according to VW. Currently the biggest Tesla battery is 100 kWh. Aside from all of that, the car also looks pretty good. But, like any concept, we’ll believe it when we see it.